Fixing stuff around the home or replacing parts in various simple appliances are the kinds of jobs that some people like to do themselves. Many homeowners relish the thought of saving a few dollars here and there on DIY repairs, and they enjoy the feeling of accomplishment that comes from fixing things with their own hands. However, when it comes to garage door springs, this approach isn't just incorrect, it's dangerous too. Spring replacement should be left to the professionals, and we strongly recommend you do not attempt it yourself. That's what our technicians are here for. 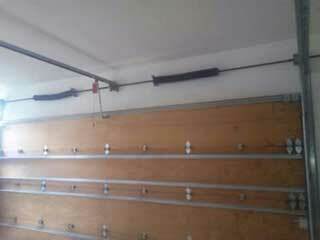 Garage doors can be very heavy, so you can imagine how hard the springs – which are the parts that support its panels – need to work while continuously lifting and lowering the door. These powerful metal coils are prone to wear and tear, and over time they can become weak and will break eventually. Metal springs flying across your garage can cause a lot of damage, not to mention, they can seriously injure anyone unlucky enough to be standing by when that happens. The potential for injury is very real, so we urge you not to take such a needless risk. Our fully trained technicians can replace these components for you quickly and without putting anyone in harm's way. The most immediate method to determine if a spring is about to break is to look for deformed coils or a gap in the middle of the unit. A gap of a few inches is a definite sign the unit needs to be replaced. Also, if you hear the springs making loud noises during operation, chances are simply lubricating them won't do the trick. If the door closes too fast, is difficult to open manually, or if it wobbles when it moves, odds are replacement is in order. Our team at Garage Door Repair Friendswood provides expert services that cover all any spring replacement needs you may have. Contact us today and let us make sure that this task is performed safely and quickly.